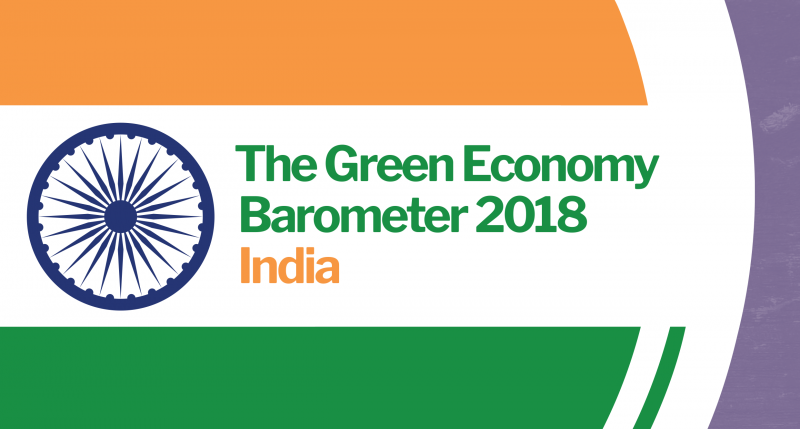 The India Green Economy Barometer 2018, published by Development Alternatives and the Green Economy Coalition (GEC), is a detailed analysis of the state of the transition to a sustainable, inclusive economy in the world's largest democracy. The India Barometer is based on in-depth research and expertise. It highlights the condition of the Indian economy and discusses the broad status of the transition towards a green economy. It offers a full and frank assessment of the challenges that India faces as it attempts to tackle poverty, pollution and populism, but also points to several encouraging signs of an accelerating trend towards a cleaner, fairer future. The Indian Green Economy Barometer succinctly presents the five aspects - reforming finance, greening economic sector, valuing nature and investing in people which are necessary to achieve sustainable development. This report targets the policy makers and practitioners who are the key actors to drive the economy towards a sustainable future. The report makes key recommendations across the sectors of economy which will be relevant for progressing, on the path towards green economy. The initiatives includes, reforming finance which entails providing incentives, risk coverage, regulatory framework, technology and infrastructure to promote green MSMEs, and the further promotion of decentralized service models and local enterprises.